History of the Persian Empire, by A.T. Olsmtead, came out in 1948. It’s quite a monster – 524 pages – and must have been the epic of that time. Anything you wanted to know (at least in 1948) is in this book. My point in picking this up was to reacquaint myself with the Persians before having to speak about them at book functions. After all, its been twelve years since I did my heavy-lifting research for Early ReTyrement and, no, I don’t remember everything I’d read or known or discovered, not that long ago. It’s interesting though – he really covers a lot of ground. 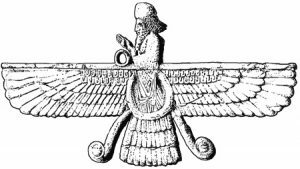 In fact, there are sinkholes of tedium in his research on the Zoroastrian religion, the astrological advances, and some of the other details. Missing are more of the interesting slice-of-life moments, how people lived, what they did, the problems they faced. It’s more at the empirical level, the sweep and thrust of the Persians and their subject races. Interesting are the references that are “assumed”, names of people, places, and legends that Olsmtead figures our world-class education (again, 1948) have provided us in the classics. For example, I know about Croesus and the muddled oracle he received, but I’m certain not one in a hundred do now. That he passes lightly over this speaks to our focuses as a society in ways I don’t find comforting. And time has advanced our knowledge of these histories. For example, at the Battle of Gaugamela, he knows the order of battle but not what occurred. Evidently, new research has revealed the sweep of the battle, of Alexander’s cavalry feint, of his drive up the middle and the risk to his baggage train that checked him in that critical moment. All this we know and he didn’t. But that’s history, always changing (or being tampered with). It was interesting for me, after reading much of the earlier empire that I vaguely remembered, to suddenly find myself with Philip, Alexander and Darius again (in the final pages of the book). It was suddenly like coming through a dimly-remembered city to a street you once lived on and remembered vividly. And there we were, with Alexander pushing past the blood-soaked coast at Issus, of Darius issuing his pleading notes to cease and desist, of the Phoenician city-states beginning to position themselves for his arrival. Somewhere in all that, maybe Mason was there. Anyway, good read for the historians out there, but maybe not for John Q.